2013 is the year of the snake and reflects in fashion, too. 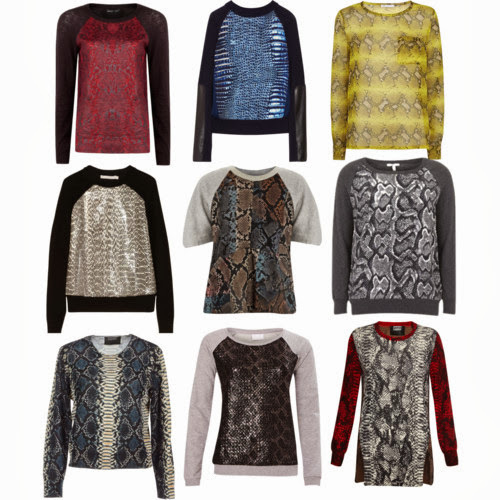 For F/W 2013 we see a plethora of reptiles of any kind whether in garments, shoes, accessories, or accents. 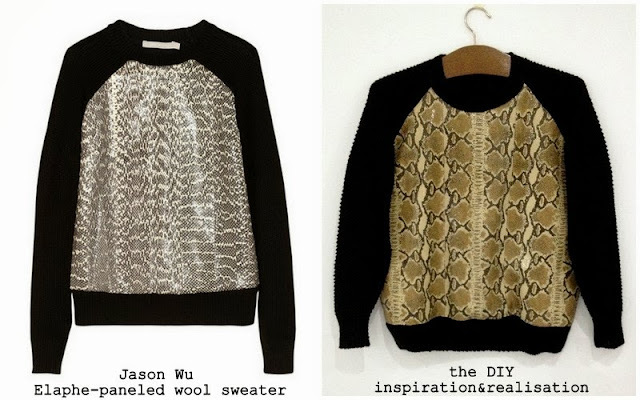 The one that triggered my DIY imagination is this sweater by Jason Wu with the raglan sleeves and the snake paneled front. The back is in stockinette with ribbed 1:1 edge and the sleeves are in seed stitch with 1:1 ribs at the wrists. I decided to use the cashmere and silk blend yarn that I previously used and had to un-ravel because I ended up not having enough, so now I have just a bit of leftover (that wil not go to waste). Because the front panel is completely replaced and attached to the back and the sleeves, this is the kind of project that can be perfect for a stained or ruined existing sweater. Just un-stitch the sides, the sleeves, and the collar and use the front as template to cut the leather or faux-leather. - leather python print (1) or snake faux leather (1 yr) or... in my case: I found this coat on my eBay shopping spree for 40$. The leather is amazingly soft, and I only used three parts for the sweater, so I still have a ton left. - black silk for lining (less than 1yr) - from my stash. on every single part of the leather and sew them together. Use the existing part of the sweater as a template and leave an extra 1/2" on each side. I overlapped the pieces of leather and sew the closest I could go. I used small pieces of double sided tape to keep the parts together without using pins. keeping the ribbed edge slightly stretched. Then sew the sides and the sleeves. pin in place and sew over. Leather tend to stick to other fabric (if you are waring a shirt underneath) and could leave some fuzz. both for warmth and because silk is not static. fold the edges in and hand sew with small stitches along the knit. Fall is officially in and I'm in full swing to keep myself warm! This is so well done! I love upcycling unworn or thrifted garments into something current and wearable. So wonderfully executed, Donatella! Great save for the coat.